Yesterday, President Donald Trump issued an executive order to enhance "Public Safety in the Interior of the United States". Note that this executive order does not apply to the Library of Congress, an organ of the legislative branch of the US government. Nevertheless, it demonstrates the vulnerability of policy-based privacy. Who's to say that Congress won't enact the same restrictions for the legislative branch? Who's to say that Congress won't enact the same restrictions on any website. library or information system that operates in multiple states? Lawyering privacy won't work any more. Librarianing privacy won't work any more. We need to rely on engineers to build privacy into our websites, libraries and information systems. This is possible. Engineers have tools such as strong cryptography that allow privacy to be built into systems without compromising functionality. It's not that engineers are immune from privacy-breaking mandates, but it's orders of magnitude more difficult to outlaw privacy engineering than it is to invalidate privacy policies. A system that doesn't record what a user does can't produce user activity records. Some facts are not alternativable. Math trumps Trump. But there's a problem: someone might steal your cookies and hijack your login. This is particularly easy for thieves if your communication with the website isn't encrypted with HTTPS. 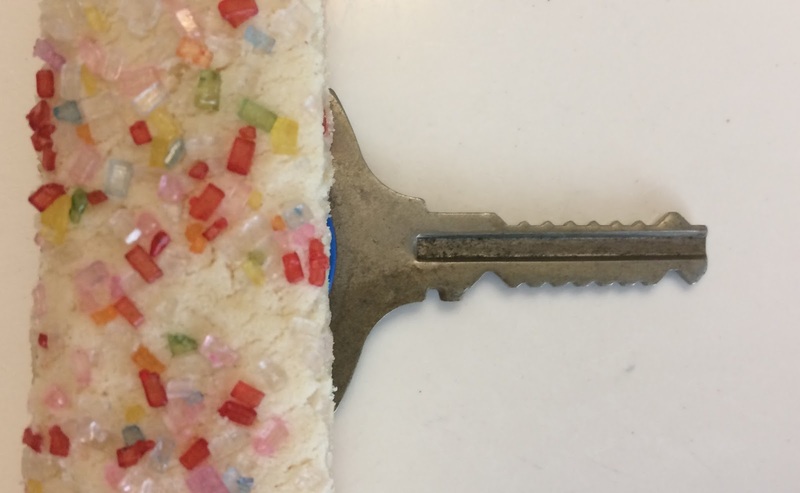 To address the risk of cookie theft, the security engineers of the internet have been working on ways to protect these cookies with strong encryption. In this article, I'll call these "crypto-cookies", a term not used by the folks developing them. The Chrome user interface calls them Channel IDs. Development of secure "crypto-cookies" has not been a straight path. A first approach, called "Origin Bound Certificates" has been abandoned. A second approach "TLS Channel IDs" has been implemented, then superseded by a third approach, "TLS Token Binding" (nicknamed "TokBind"). If you use the Chrome web browser, your connections to Google web services take advantage of TokBind for most, if not all, Google services. Top 3rd-party content hosts. From Princeton's OpenWMP. 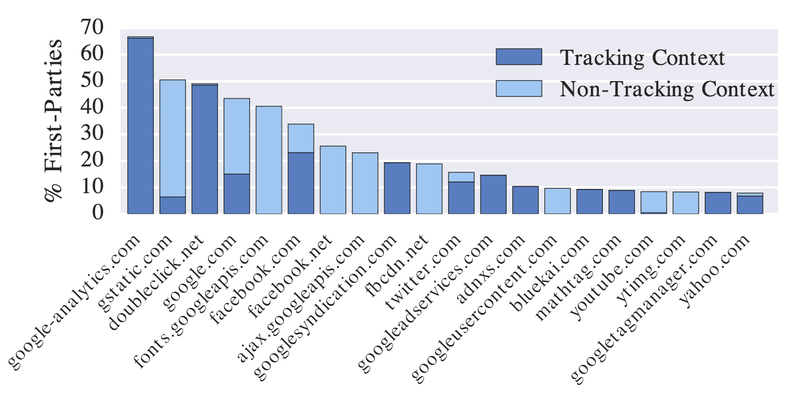 Note that most of the hosts labeled "Non-Tracking Content"
are at this time subject to "crypto-cookie" tracking. But if you use Chrome, your requests for these font files are no longer stateless. Google can follow you from one website to the next, without using conventional tracking cookies. There's worse. Crypto-cookies aren't yet recognized by privacy plugins like Privacy Badger, so you can be tracked even though you're trying not to be. The TokBind RFC also includes a feature called "Referred Token Binding" which is meant to allow federated authentication (so you can sign into one site and be recognized by another). In the hands of the advertising industry, this will get used for sharing of the crypto-cookie across domains. To be fair, there's nothing in the crypto-cookie technology itself that makes the privacy situation any different from the status quo. But as the tracking mechanism moves into the web security layer, control of tracking is moved away from application layers. 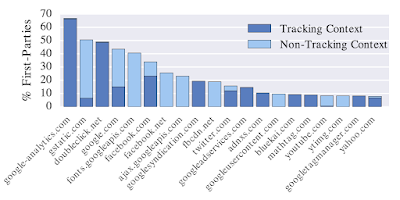 It's entirely possible that the parts of Google running services like gstatic.com and googleapis.com have not realized that their infrastructure has started tracking users. If so, we'll eventually see the tracking turned off. It's also possible that this is all part of Google's evil master plan for better advertising, but I'm guessing it's just a deployment mistake. So far, not many companies have deployed crypto-cookie technology on the server-side. In addition to Google and Microsoft, I find a few advertising companies that are using it. Chrome and Edge are the only client side implementations I know of. For now, web developers who are concerned about user privacy can no longer ignore the risks of embedding third party content. Web users concerned about being tracked might want to use Firefox for a while. This blog is hosted on a Google service, so assume you're being watched. Hi Google! OS X Chrome saves the crypto-cookies in an SQLite file at "~/Library/Application Support/Google/Chrome/Default/Origin Bound Certs". I've filed bug reports/issues for Google Fonts, Google Chrome, and Privacy Badger. Dirk Balfanz, one of the engineers behind TokBind has a really good website that explains the ins and outs of what I call crypto-cookies. (added 12/29/2018) It seems that Chrome will be removing support for Token Binding.